Part 9 in a series featuring sites I visited in Ireland while researching my second novel, The Prince of Glencurragh. See previous posts listed at the end. I first discovered Coppinger’s Court as a notation on a West Cork tour map. I was seeking a route that my characters in The Prince of Glencurragh would travel from Timoleague to Clonakilty and west along the coast to Baltimore. I wondered if it might become a stopping place along their way, but instead the manor house was so dramatic it inspired another scene altogether. Coppinger’s Court, also known as Ballyvireen, is located along the Glandore road about two miles west of Rosscarbery. Described as a fortified manor house in the Elizabethan style, the structure has three wings off of a central court, creating nine gables, and each exterior wall has large mullioned windows that would have ensured good natural light. With a description like that, I had to see it. And I already knew it would become the model for the fictitious Rathmore House, the seaside home of the Earl of Barrymore located near the town of Baltimore. In The Prince of Glencurragh, Faolán Burke, his abducted/intended bride, and accomplices are rushing across Ireland’s south coast toward Baltimore. There they must meet the Earl of Barrymore who has promised to negotiate the marriage settlement. The story takes place in 1634, just three years after the town of Baltimore has been devastated by an attack and raid by Algerian pirates. This attack was a real and violent event. Most of the town’s residents were abducted, a small number of them were ransomed, and the rest were killed, sold or used as slaves. The few survivors moved inland to Skibbereen for safety. I placed the Earl of Barrymore’s house, Rathmore, at a cove between the two settlements. Sir Walter, however, was far from modest. He was a businessman, lawyer, landowner, and moneylender, who acquired many of his properties from borrowers who defaulted on their loans. Several sources support his reputation for ruthlessness, and perhaps unscrupulousness. Sir Walter wished to own Baltimore for its castle and properties, and lucrative pilchard industry. He was involved in legal battles for ownership, but in 1610 he and other claimants agreed to lease the town to English settlers for 21 years. By the end of the lease, Coppinger had brought a case before the king’s Star Chamber, claiming the town as his own and asking to evict the English settlers. But he grew frustrated when the chamber members were reluctant to decide the case, and reluctant to evict prosperous families who had made improvements to the properties. And then came the pirates. If he was responsible, it seems Karma won in the end. Coppinger was not to benefit from his long-coveted Baltimore. The town’s vast annual pilchard run suddenly disappeared, and by 1636 he had leased out his new castle and village. Sir Walter died in 1639. Then came the great Irish rebellion of 1641. Coppinger’s Court was ransacked and burned, and then confiscated by Oliver Cromwell in 1644. By 1690 after years of disuse, the great house was on its way to becoming another beautiful ruin. An heiress, a castle, a fortune: what could go wrong? 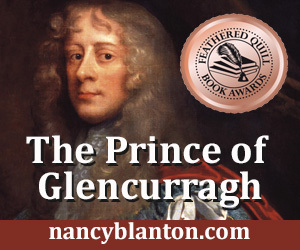 The Prince of Glencurragh is available in ebook, soft cover and hard cover from online booksellers.